A larger cid engine could use the shorter runners. Also having been there and done that with several combos. A used Superram is only maybe 200$ more than a set of LTR big tubes. Well well worht the 30hp extra topend pop. Last edited by OMINOUS_87; 01-11-2005 at 08:43 PM. yeah i have been huntin for a used superram in the 700 dollar range. hope it works out. i have that magazine too,and summit racing sales the superram now for $779 for top half and for base 517 scoggin dickey sales the gm 383 with the super ram install on it. I paid $500 for my upper, plenum runners, used. I bought my SDPC base new. P.S. I plan on bringing more members to the boards, now that I am in school. Apparently alot of people in the area are interested. Fox Valley Thirdgen crew up and coming! Jegs has the Super Ram for $750 new. I bought mine in 1997 for $700. I would love to find the SR uppers for $500 , would buy it in a heart beat. Where? I never see the uppers for sale. I have an Vortec with the hotcam, I'l sure a SR would open it up a little on top. But did I miss something, or were all the TPI's that performed well extrude honed? What I'm saying is they used an extrude hone and DFI, that has to factor in for something, and yes I know you can tune a car pretty close through the prom. What I'm saying is they got those #'s with a maxed out TPI, with the highest $quality stuff. - 10:1 383" heads and zz9 and TPIs big mouth and LTR, great torque but no fun over 5200rpm. sounds as if we give up alot by running unported equipment. Your damn right you need to port your base. I got that base, and it is the poorest flowing aftermarket base out of the box. I put mad time into mine and removed a mad amount of material, I didnt think paying extrude hone would have got me anything more then what I did to it. But in as cast condition, I would never consider running it on my car, thats how poor I think it is out of the box. Great article . I had to go out and get it . Thanx to Acceled Z for telling me where to get it up here. I have a couple of Q's about these tests though . I have alwasy been under the impression that LTR setup's ( like the one I have) don;t see alot of high revs . SO why is a stock TPI makeing power to 6000 rpm ???? It destroys everything I have read ...or seen on a chasis dyno . What made it flow there ???? I love what they say about the Edlebrock unit ......"lot's more room for porting" SO remember that this was tested with a STOCK TB ...and STOCK plenum . The TPIS set up was a matched setup and the plenum was matched too also , they used a bigger TB . The ASM unit had a matched plenum and they tryed different TB's ..... try this with the edlebrock unit as well .....and then see if it's the baddest LTR setup . I think the edlebrock unit is .....nothing personal here . yeah, superram system for 700 used. i havent seen just the uppers for anything less than what summit sells it for. the edelbrock unit is nice for the price cuz it isnt ported out of the box. TPIS big mouth is. thats where the extra 100bucks is. lol, so edelbrock is good deal in that if you do porting yourself you can gain same flow characteristics. i seen before and after pics of a golf ball not fitting into the runner holes and after porting, the golf ball easily rolls in and out. so alot of room to do some serious work. i am somewhat dissappointed that they didnt use SLP runners. they are very popular and cheap and i was curious to see how well they would do. they can be ported out really well and you should see similar numbers as in those tests. Last edited by Orr89RocZ; 01-12-2005 at 09:18 AM. this article is awesome!!! it just makes me feel even better since im running the trickflow 195's on my 383 (10.6:1 CR) with the HSR and a 58mm tb and a close enough cam 230/236 .544/.555 after my 1.6 rockers. i now know im extremly close to my 500hp mark and with some head work i think the smaller cam will get me there. whats holding me back now is the 1 5/8 shorties im running...looks like 1 3/4 are in the midst. they did run 1 3/4 primaries for the test didnt they???????? The stock tpi intake is not 'pulling' to 6000 rpm. Just because it flatlines after 4500 doesn't mean it is still 'pulling'. Pulling would imply that the car is 'pulling' harder, meaning going faster, and that is not happening if the intake is flatlining. The intake is restricting airflow when it flatlines. yeah but you would expect power to drop off drastically after 5000rpms with stock tpi like what the stock L98 does. Don't you need adapter plates to run 1 7/8"+ headers? I know I did when my car had the Hedman 1 7/8" Husslers. It doesn't look like they're using any from the pics. Those tubes do look huge though. I guess that's our first question. they make 1 7/8's and 2 inch for camaro cars. its just when you go to big block sizes over 2inch that you need the adapter. thats what i thought. the question is, can you squeeze that header into a thirdgen engine bay?? The stock L98 isn't a 383 with a cam sucking that air through. It seems as though with this engine, it's sucking enough air to increase RPM but not horsepower at those rpms. The engine combo itself is built to rev higher, but since the TPI wont allow the increase of CFM requirements to be fullfilled..... the curve... is flat. Why isn't this a sticky yet? Pretty informative and no one is really getting off track with this. Good thread. Thanks for posting up the article OMINOUS_87 because I would have never found this magazine anywhere around here! AFAIC, the HSR is the winner as far as numbers:$. And i'm a SR guy, lol. Actually I could make a single or dual plane efi intake for less than the HSR and it would flow as good as the HSR. HSR is good, but not as impressive as I could make one. I still don't know if I agree with HSR being the 'clear' winner on numbers alone. A peak number is as fast as a broader range. Not only that the cam was a little more biased to the SR and the HSR. As with all of the studies have proven, the SR would have been a lot better with a flat pattern cam. The 219/219 cam was made for the SR, and in most cases is the best to use with the SR (depends on heads). The AS&M with TPIS BM manifold would have been better with a 270 or 276 cam. It wouldn't have made the same numbers as the HSR, but I have seen broader power bands than what they got. That's great, you do that. It's just that your home made intake wasn't tested in this shoot-out And as soon as you add one of the 4bbl style TBs the cost goes up significantly. Actually, I said that the HSR was the clear winner as far as numbers compared to $ is concerned. Christ, a set of runners is almost as expensive as the HSR. The "219" cam was designed to work with LPE's CNDd L98 heads and the Super Ram. Those heads have an awesome I/E ratio. That's the same cam I have and I love it. Granted, but the point was that the cam and heads are a little biased towards the HSR and Mini-Ram in the first place. Personally I like the LTR look and troque, but mine doesn't see much track time at all. A slightly smaller cam will go faster than a cam that is too big. Only having Vortec heads, while they flow pretty well out of the box, aren't really an ideal match for the miniram which wants gobs of everything! Call your favorite cam manufacturer, and tell them what you have and what you want to do, and put the cam THEY tell you to, in that engine. Not what anyone on here says to use. Yeah, I know that is the best route to go, call up and ask. Just figured I would see who has what. Thanks for the info guys. edit: Oh, and on a side note, for anyone looking for this magazine, Barnes and Noble should carry it. I picked it up tonight. This is a pretty nice magazine. IMO, better than Super Chevy, Car Craft and maybe even GM Hi Tech. GMHTP is nice for newer f-bodies and newer "Hi-Tech" cars. Pretty interesting featured cars in this mag and some nice write-ups. Last edited by 86IROCNJ; 01-14-2005 at 08:46 PM. Not trying to lessen anyones opinion, I just think that it should have been reflected better that a homemade efi can achieve more for less. You can do as anesthes and many others and I am now doing and just use a big monoblade throttle body and an adapter plate. The whole set up for $300. Here’s the question. I see that the TPIS big mouth intake was good for 50hp and 35 ft/lb. If I was to put this intake on my car would I get the same 50hp increase on my L98? I realize that they tested this intake on a 383 with heads and cam. My engine is obviously putting out less power to start with than the 383 so will the overall gain be less or remain the same? Sorry if this is a dumb question. How in the world did the stock TPI pull past 6000 RPM's on a 383??? It should completely dies after 4800. Visit 89 Iroc Z's homepage! It did die. Even though the HP numbers remained about the same, the torque at each point was much less as the engine speed climbed. So even if it had 250hp at 6,500rpm or whatever, it still didn't have enough torque to accelorate much more. The reason the HP remained nearly constant is because of the way the HP formula works. I can't find this magazine anywhere. I tried 7/11, Wal-Mart, Target, Barns Noble. Is there anywhere online I can purchase it? You don't want the most HP under the curve, you want the most TQ under the curve, which would mean a nice flat torque curve, which typically translates into a nice HP curve, as HP is a function of TQ. 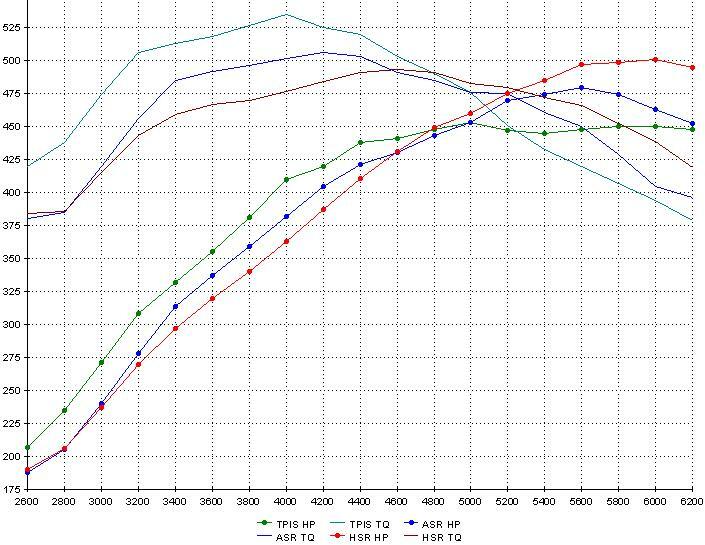 If you look at the Holley EFI graph, you'll see a nice flat TQ curve. As for the shifting question restate it and... what is the combo? Where is the power band? What do I have for a TC? Those all play factors. It did die. Even though the HP numbers remained about the same, the torque at each point was much less as the engine speed climbed. . In the TPIS catalog, they claim 20 HP on a stock L98. You'll probably pick up an additional 15 Ft Lbs. as well. This is the route I'm planning, unless the BBK intake changes my mind. I like my 3.23's and the gas mileage too. Yea me too. I would like to keep the look of the origional TPI intake so I'm thinking the big mouth bottom intake($425) and the TPIS LTR($475). Also maybe a 52mm throttle body($280) and possibly get the plenum ported. The only thing is the $$ worth the performance. Not counting any port work it would be around $1200 for about 30 hp. Not a lot of gain for that kind of dollar amount. What do you think? Yea I have 3.27 gears and I'll probably stick with them since my car does see some highway miles. Some 3.73 would be nice but a little too low for me on the interstate. I'd like some 3.45 but probably not worth the money for that minor of a change. Why not get the runners from the company that makes them? Same could go for the baseplate, but at least TPIS ports that. For the $$$, probably not the best route but I like the TPI looks as well and if you're going to keep it, you don't have many choices besides TPIS or AS&M. The intake can easily support enough power with heads and cam to run mid to low 12's with 3.23's. If that's not quick enough, you can always go the SC, Turbo or NOS route. As far as price, also keep in mind you'll need gears and a converter to get the most out of a MR or HSR set-up. So TPIS buys the parts from arizona speed and then marks up the price and resells them. Do they port both the runners and the base? I didn't see the base manifold on arizona speeds website, do you have to call them or something? How well does the stock TPI plenum flow? Does it need to be ported or port matched? What about the throttle body, does it flow well enough or should it be upgraded to a 52mm piece or would that be overkill? I really like the look of the stock TPI setup and the intake makes nice torque. I don't want to give up any torque like some of the intakes do which is why I'm interested in the big mouth intake. I just don't like how the stock TPI starts to die off after 4500 rpm. It would be nice to have power gains all the way up to 5500 rpm. Don't quote me on this, but I believe Edelbrock makes the base for TPIS. I read it here a couple years back. Edelbrock does cast the baseplate. I estimated the HP and TQ numbers from the article’s graphs using a squaring ruler for the numerical chart listed below. If HP vs TQ came out different than what they should have calculated, I split the difference to come up with the following numbers. So the numbers should be fairly accurate. I plugged the HP and TQ numbers for the TPiS, ASR, and HSR intake systems into a worksheet to get an overlay of sorts from the top three intakes (in my opinion). I’m only listing the HP numbers,, which were painful enough to put in this format. Best numbers generated by system (variance of 3hp) from to rpm listed. Last edited by BadSS; 01-17-2005 at 08:41 AM.